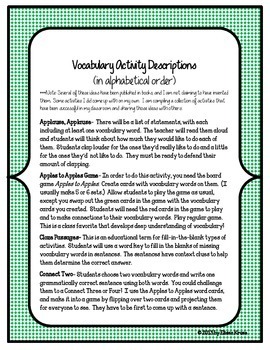 This collection of vocabulary activity templates and game templates (with original examples) can be used to work with words from any story, piece of text, content area, or spelling word list. Most of the games are based on real board games. 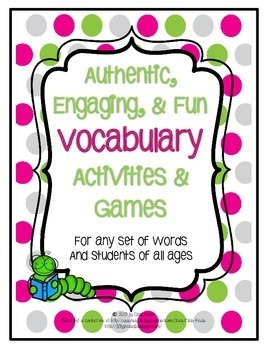 Each activity encourages students to make real-life connections with words so that they make authentic meaning out of them. Students will use upper level thinking skills to complete many activities. Activities require discussion, analysis, judgments, critiques, evaluation, and synthesis of words and their meanings. They also work great for literacy centers. Vocabulary can be very tough to teach. It often is underdeveloped or completely undeveloped when it comes to reading programs, which makes it tougher on teachers to teach meaningful vocabulary lessons. However, it is imperative that students are working with and learning about new words every day. 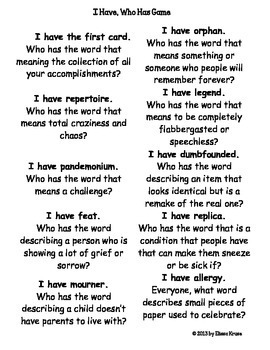 Please understand that these are templates (with directions and examples included) for you to use to with your vocabulary words. All of the templates are Microsoft Word templates so that you can create your own items. If you have any questions, or need any assistance, please don't hesitate to contact me. Teaching vocabulary is my passion. I really hope that you enjoy this set and that your students enjoy the activities that you create for them using these templates.